Healthcare technologies have proven their worth for practitioners and facilities in increasing the quality of patient care while saving time and streamlining operations. 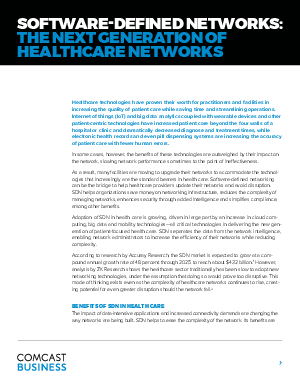 In some cases, however, the benefits of these technologies are outweighed by their impact on the network, slowing network performance sometimes to the point of ineffectiveness.Software-defined networking can be the bridge to help healthcare providers update their networks and avoid disruption. SDN helps organizations save money on networking infrastructure, reduces the complexity of managing networks, enhances security through added intelligence and simplifies compliance, among other benefits.